There's been much noise out there about this piece of filmmaking cinematic history. 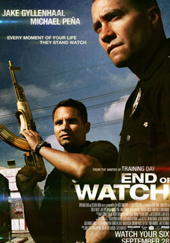 I actually read somewhere a mention of "Training Day" in the same sentence as "End of Watch." Well, let's put our two cents out there... Even, both films share the same scribe, This is not, in any way shape or form, remotely in the category of "Training Day", and all that noise about this film, well, let's save it for something else worth barking about. I was actually baffled to find myself reacting this way to this movie, since David Ayer has a long list of cool movies to his credit. I guess everyone missed a home run here and there. And, then again, this is just my two cents... Swimming somewhere deep in the current idiotic trend to shoot movies with video cameras the filmmakers found what barely passes for inspiration as a visual theme. Bring a bottle of Advil with you. The camera work is in deed that bad. But if the imagery wasnt bad enough of an insult to the audience's intelligence, don't waste your time finding any character development or plot evolution. This is a linear one way ride into what can be best described as an exercise in boredom. And, no, shooting Mexicans for the same tired old reason we've all seen before, and exchanging a never ending repartee of pointless dialogue in a patrol car, does not pass for creative thinking.